Serifos Island, one of the most charming islands in the Cyclades, is celebrated for its marvelous beaches, 72 in total, as well as its quaint villages and breathtaking landscapes. Serifos is the ideal vacation spot for short or long holidays, as it can be reached by high-speed boat in approximately 2,5 hours and by conventional boat in about 4,5 hours from Piraeus Port in Athens. Serifos is also connected to the Cyclades Islands of Santorini, Paros, Ios, Syros, Folegandros, Kythnos, Sifnos, Kimolos and Milos, making it a great destination during your island-hopping tours. Welcome to Naias Hotel in Serifos! The Naias Hotel is located in the popular seaside resort of Livadi, on the southeastern coast of the island of Serifos Greece, just 500 meters from the port front . The environment of the hotel is elegant, with a beautiful garden that has potted flowers, where guests can sit and admire the bay, the golden beach and the sunset view. 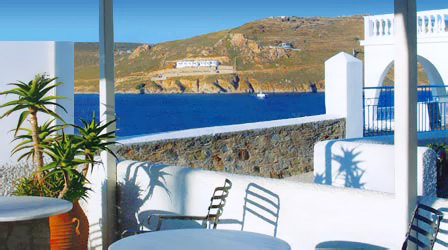 Its peaceful and lovely surroundings make it one of the most preferred Serifos Greece hotels. The Naias Hotel in Livadi, Serifos is a traditional Cycladic-style 2-building complex, whitewashed with touches of sea blue throughout. It is comprised of tastefully furnished rooms for rent that can accommodate up to 3 persons. During their stay at the hospitable Naias Serifos Hotel, guests are pampered with first-rate services and excellent facilities to ensure their ease and comfort. 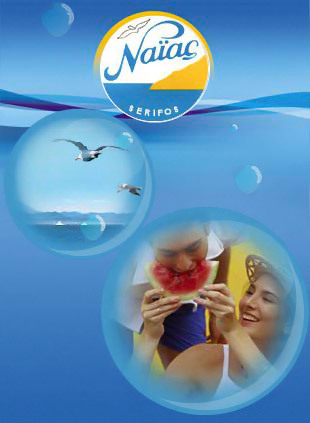 The Naias Hotel, one of the friendliest Serifos Greece hotels, operates all year round. The settlement of Livadi is located on the southeastern coast of Serifos and is considered the loveliest village on the island. Livadi is the most popular holiday destination in Serifos and the main port of the island, well-known for its Cycladic-style architecture, with white cubic houses built in an amphitheatric pattern up the hillside to Chora, the capital of the island. Surrounding Livadi are beautiful beaches and exciting entertainment venues.